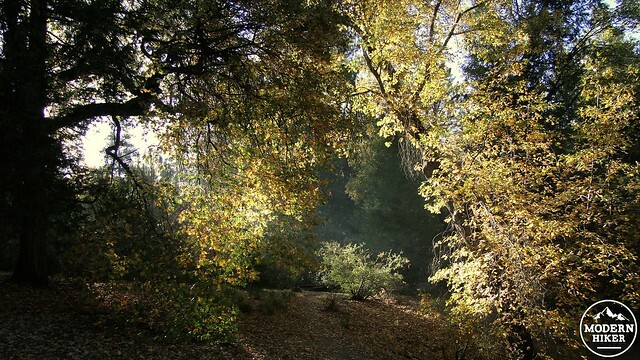 Beyond its beautiful forests and meadows, Palomar Mountain is most famous for its Observatory. 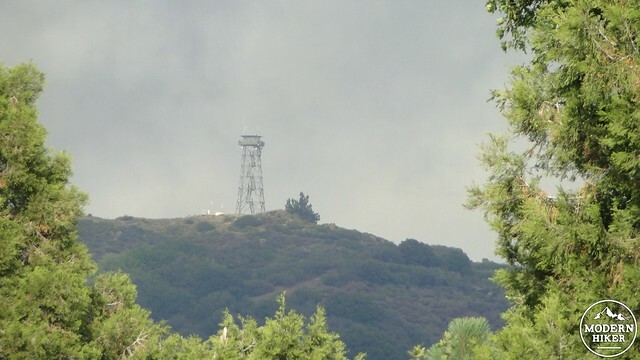 Established in 1928, the Palomar Observatory contains several telescopes, including the 200” Hale Telescope, which is open for visitation from 9am to 4:30pm. The campus, which is beautiful in itself, is operated by the California Institute of Technology. More importantly though (at least for our purposes), one can hike up to the Observatory from the nearby Observatory Campground through oak and pine woods that put on a great foliage show during early- and mid-November. 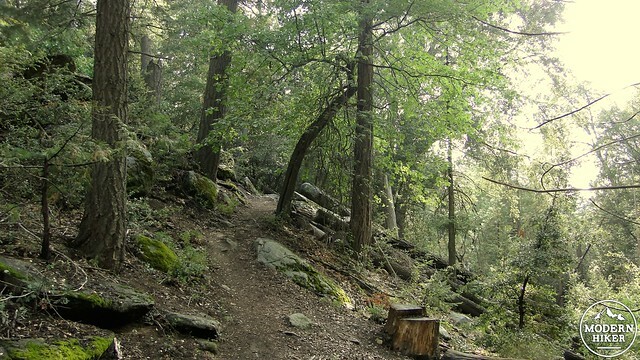 The Observatory Trail is one of four National Recreation Trails in San Diego County. 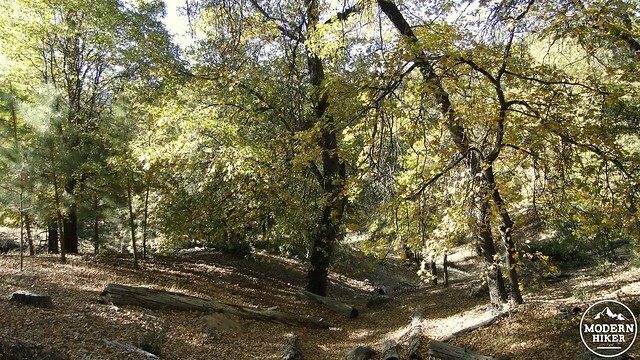 The trail runs one-way along South Grade Road between the Observatory Campground and the entrance to the Observatory campus. 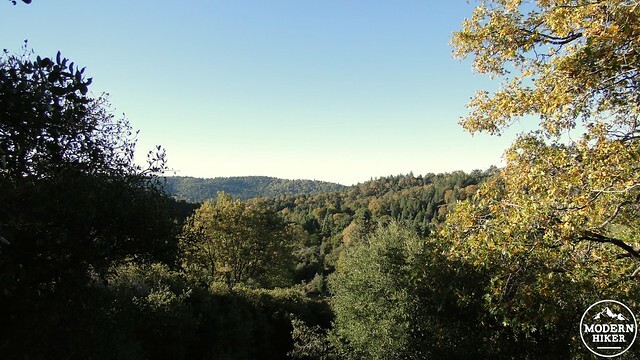 The route climbs moderately through varying oak woodlands, conifer woodlands, and chaparral, and it occasionally opens up to offer some nice views of the Palomar Mountain range. 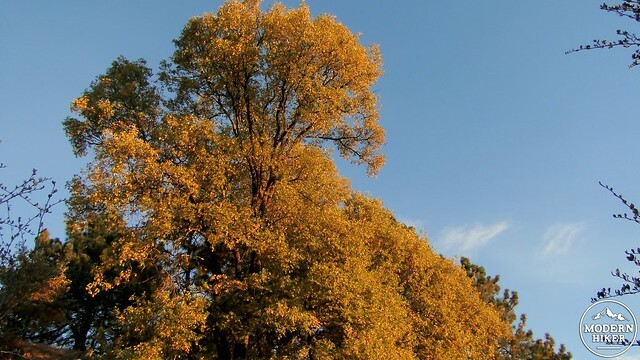 There are a number of California black oaks present from start to finish, and the leaves on these oaks turn a brilliant gold during mid-November. The classic way to take this hike is to start from the campground, as it allows one to get the uphill done on the first half while enjoying the downhill and on the back end. However, the campground is usually closed between December and April, leaving the only parking to be at the Observatory. 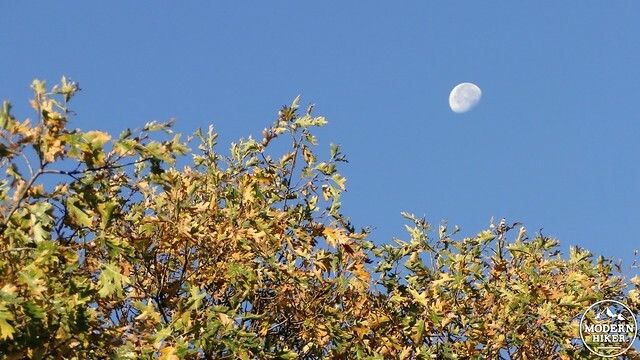 During the winter months, one can hike down to the campground and back up, or if you have a willing participant who does not mind nosing around the Observatory while you hike, you can do this trail as a one way shuttle hike. However, you will not earn your calorically-dense treats at the end if you take the easy way. This write-up will present the track as if being taken from the campground, although you can easily read it from the back to the front to reverse the course. Fortunately, the trail does not intersect with any other routes, making it an easy trail to follow. To start, find the parking area next to campsite 24 in the campground and look for a faded sign at the trailhead near one of those campground amphitheatres where rangers give talks. The trail commences through a pair of wooden fences dividing the amphitheatre and site 24. 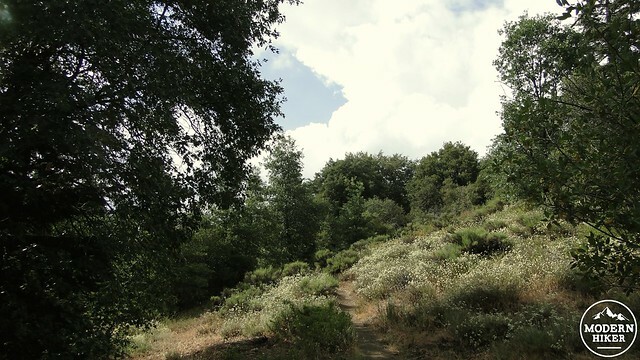 The trail begins to wind through a series of small ravines that drain the hillside during heavy rainfall. 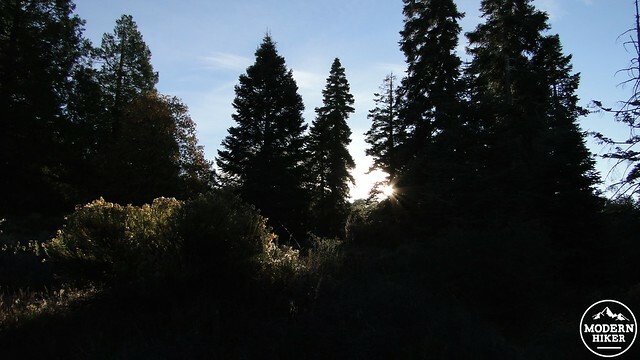 The foliage to start is thick with a variety of conifers, including incense cedars, bigcone Douglas fir, Coulter pines, and the occasional white fir, in addition to both canyon live oak and black oak. There’s a fair amount of poison oak present in these ravines, so it pays to be able to recognize it and to be mindful of where you’re stepping. Keep your eyes peeled for Coulter pine cones, which are massive and barbed and look as if they were designed by somebody who had murder on the mind. 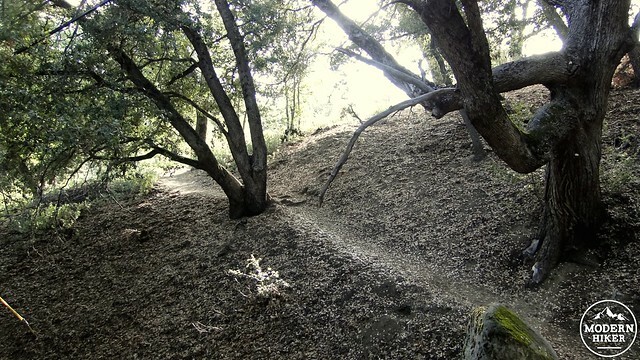 After winding through these ravines, the trail will begin a moderate and relatively steady climb through a nice stand of black oaks and then into a stretch of chaparral. After about half a mile, a wooden viewing platform emerges on the right of the trail, which offers a nice view out over Mendenhal Valley. The view is lovely, but it is a little sad that Mendenhal Valley, with its plush meadows and trickling streams, is private property and closed to hiking. Should you hike this during the fall months, the sun will tend to rise directly over the valley, which stretches out to the east. 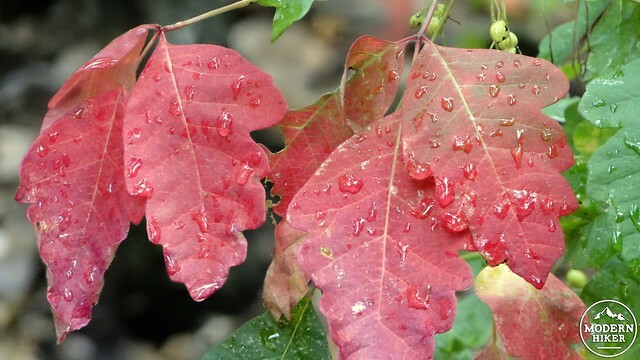 The sight is particularly lovely, especially when the early morning sun lights up the golden black oak leaves. The trail will gain a modest ridge and descend into another ravine heavily shaded by live oaks before winding back around and heading uphill some more. On the south-facing, chaparral-covered slopes, views will open up to the south at the rolling, forested slopes of Birch Hill. During spring and fall, these hills are a uniform green. 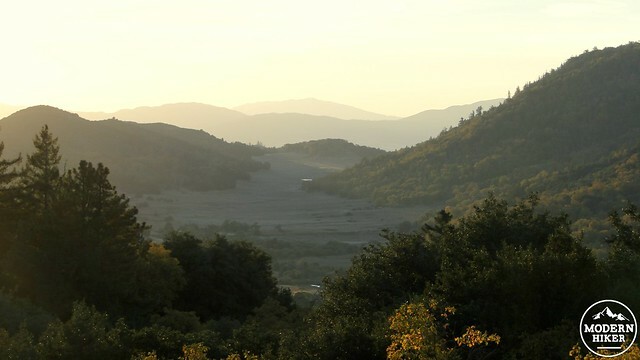 However, during the fall, countless gold splashes liven up these hills, which has caused a few people to make a comparison between Palomar and some of the rolling hill country in Vermont. I’ve never been to Vermont, so I can neither confirm nor deny, but the effect is especially nice in the fall. Further on, the trail will pass through a thick grove of Coulter pines. These pines don’t occur at this specific spot naturally, but are actually a Penny Pines plantation. Penny Pines is a USDA forest service program that seeks to reforest places that have been the victim of stand-replacing fires. 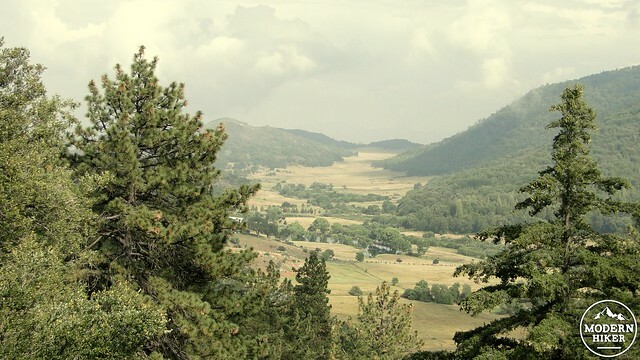 Through this program, 27 million seedlings have been planted, resulting in the renewal of 88,000 acres of National Forest land in California. The NFS still runs the Penny Pines program, and this website can tell you how you can donate. The trail will come around a bend and dip into a heavily-forested ravine that’s supported by a seasonal creek. After crossing the bridge and going up the hill a bit, you will have nearly reached the end of the Observatory Trail. However, it is important to be really careful on this last stretch as it passes through a dense patch of the dreaded Poodle Dog Bush. This bush is not trimmed regularly, and it can jut out into the trail and make a swipe at your face. For people with extreme sensitivity to Poodle Dog, this is a good place to turn around. 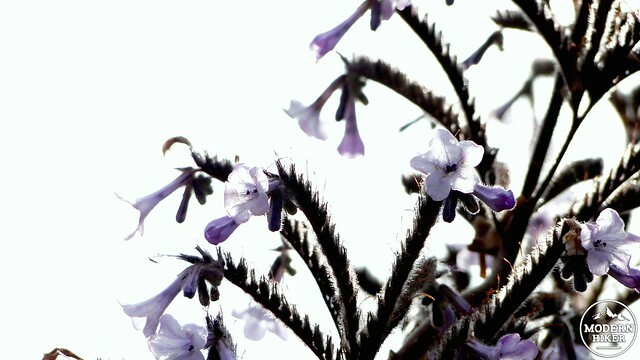 One word about Poodle Dog: while it is nasty to touch, it puts out beautiful flowers. If you choose to wiggle your way carefully through the patch, you will have come to the end of the Observatory Trail. If you want to turn back, you will have enjoyed a good hike. 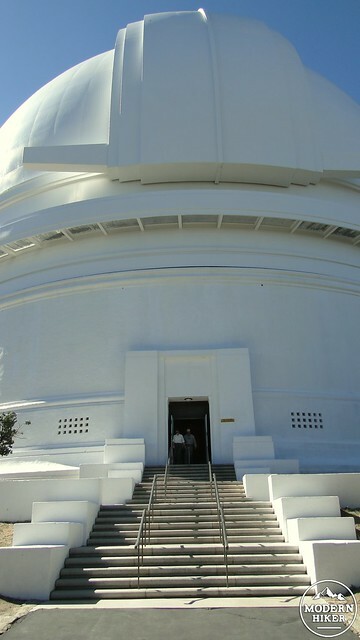 However, if you want to check out the Observatory, simply continue past the gate (provided it is open) on the right and walk through the parking lot. Past the parking lot is a long, paved walkway that passes the Observatory’s museum and a grove of planted sequoia trees. On the left is a large, fern-draped meadow. Views north toward Mt. San Jacinto and Mt. San Gorgonio open up here, and soon you’ll see the huge white dome of the Hale Telescope building. It looks a lot like a golf ball. I hope some clever photoshop artists will insert a golf club about to make contact with the dome and make it go viral. You can enter the telescope dome and see the mechanisms that allow the enormous machine to move about. Numerous displays provide information on the history and discoveries made here, which have been fundamentally significant to our understanding of the universe. I know this isn’t outside and is therefore not really hiking, but this is an awesome and unique destination for a hike. After you’ve enjoyed the Observatory and your limited access on the Observatory campus, return back to the trail and take a moment to admire what is probably the least helpful trailhead map ever. The map consists of a squiggly line between a triangle and a dome. Thanks, Forest Service. 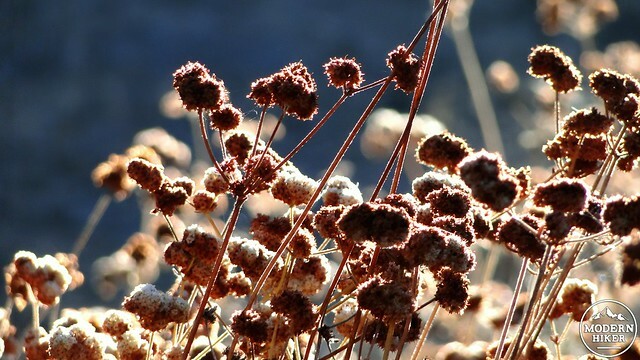 Pass through the Poodle Dog bush carefully and continue back down the hill and through the woods to the campground, where you will either get back in your car, or, hopefully lounge around at one of the campground’s serene sites with an icy beverage and some salty snacks. – Unless you are staying at the campground, you will need to display an Adventure Pass at the trailhead if you are parking in the campground. – The Observatory is open between 9 and 4:30, unless the scientists are prepping for some work. If it is a dark, cloudless night, do not drive up to the observatory as the lights from your car can upset the delicate and sensitive readings made by the telescope. The trail is well-traveled, well-maintained, and easy to follow. There are no junctions. As long as you stay on the trail, you will not get lost. The trailhead actually lies within Observatory Campground, making Observatory a no-brainer for camping. Observatory Campground is really nice, and there are some open spaces for amateur astronomy. Doane Valley Campground in Palomar Mountain State Park is also excellent, but it's about 7 road miles away and often fills up faster than Observatory, especially on the weekends. After taking either South Grade or East Grade Road up the mountain, head north past Mother's Kitchen on Canfield Road, which eventually turns back into South Grade Road. The Observatory Campground is about 2.7 miles up the road on the right. Enter the Campground and follow the loop to the amphitheater just before site 24. Display your Adventure Pass. You can self-pay for the day. $5 per car. During the summer weekends many of the parking places are reserved for campers but there seem to be just a few day hikers.Nice route. Less than an hour hike to the summit. I hiked this earlier today with my husky. We encountered the most beautiful cougar, not more than 20 yards in front of us! Incredible. I love your site! An Adventure Pass is an access pass currently needed in parts of the Los Padres, Angeles, San Bernardino, and Cleveland National Forests. You generally only need them if you're using a developed area and can pick them up at Forest Service offices or other places like sporting good stores, gas stations, etc. The Forest Service has a list of places to pick up the passes on their web site. Fantastic! Hope you have a great hike! I had never heard about Poodle Dog Bush. It's definitely something I will look out for on the trails around here now.